George Bellairs was the writing name of Harold Blundell (1902 – 1982). Not much is known of this writer who appears to have been quiet and loyal – with his employers as well as his readers. He was born in Heywood, just across the county border from Saddleworth – at that time part of the West Riding of Yorkshire. He started work at the local bank at fifteen and stayed with the same employer for the rest of his working life, having worked up to the post of Bank Manager by the time he retired. Blundell and his wife then moved to the Isle of Man where some of the Littlejohn books are situated. Even though there are over forty Bellairs novels featuring D.I. 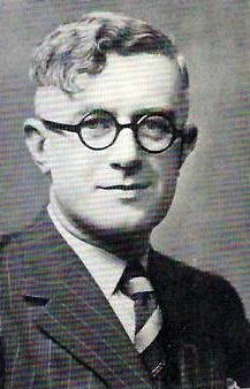 Littlejohn, he was classed back then as a mid-list author with a strong following who never quite reached the heady heights of Christie or Sayers. Anthony Berkeley who had reached notoriety during his writing career, became a great fan and friend of Bellairs. As Martin Edwards observes in his introduction to these two novels, Bellairs wasn’t all about ‘the puzzle’. 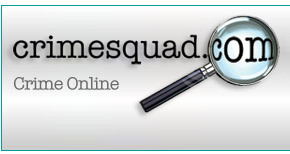 This is methodical police work, showing the hard graft of a police officer searching for the hidden truth. As Edwards rightly mentions, it is Bellairs eye for human nature that lifts his books from being classed as simply a ‘puzzling crime story’. I have been collecting Bellairs books from second-hand bookshops for years. Again, this is a writer that many people have never heard of before. Hopefully, with this new omnibus collecting two of Bellairs early novels, (these two constitute Littlejohn’s fourth and fifth outing in Bellairs bibliography), are a wonderful stepping on point for this author’s work. As pointed out by Edwards, Bellairs has a wonderful knack of painting the people who populate his books. In ‘The Dead Shall Be Raised’, which is based at Christmas just after war has broken out, there is a stunning scene as the concert of ‘The Messiah’ in a small country church is performed. Bellairs wonderfully shows the defiance of a country amidst a terrible war, a threat of bombs, a shortage of food and supplies – amongst all this darkness there is light in the form of song. This image became so tangible in my mind that I felt I could feel the cold of that church, as the music lifted me and I became one of the congregation. This beauty is also juxtaposed with the stark moors which surround Saddleworth, (said to be a fictionalised version of Blundell’s place of birth). It is on these moors that an old crime is discovered during the performance. Bellairs brings alive the people caught up in this drama and this first is a very sad story. It brings it home that it is a blessing that we no longer have the death penalty as here a wronged man would have been sent to the gallows if events hadn’t taken a different path. I would say that ‘The Dead Shall Be Raised’, although it features Littlejohn, is not what I would call your average police procedural, but more a village drama where murder is involved. 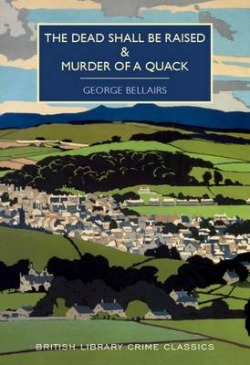 ‘The Murder of a Quack’ is much more along the lines of your typical police investigation. Nathaniel Wall is a bonesetter – an osteopath. He has great respect from the local villagers of Stalden, Norfolk, but some, in particular the new doctor deride Wall as nothing more than a ‘quack’. Having spent the night at her sister’s, Wall’s housekeeper comes back to find his surgery door locked. After the local bobby breaks down the door they find a hideous discovery – Wall is dead, strung up in his own apparatus. Littlejohn is called in and the hunt is on for a murderer – but what do a few old newspaper clippings stuck in the back of a book have to do with the present case? With some digging about Littlejohn eventually finds his culprit. Out of the two I found the second more gripping, but both have their own merit. In both Bellairs paints a vivid picture of life during the war times. He also has the gift of giving a little history even to those who have a mere walk-on part. I loved his little story of the postmistress in Stalden who claimed to be fluent in French. This reminded me of E.F. Benson’s superb Mapp and Lucia when it surfaces that maybe Lucia isn’t quite as proficient in Italian as she professes. It is these little sparkles of humour that make me think Blundell/Bellairs always kept his ear out for a good story and then squirrelled it away for a future book. It is always pleasing when an author I have collected for years is back in print. I also love the ‘omnibus’ edition with two books. I hope the British Library will roll with this as many of Bellairs books, as well as others from the Silver Age of crime fiction, did not write the doorstoppers they do today, so two books could easily be encased in one volume. This is another outstanding addition to an already superior collection from the British Library Crime Classics collection.